Nutrition is an important aspect of pet ownership. While cats are generally regarded to be more resourceful, more independent in looking for food, there is a much greater possibility for them to pick up disease-causing microorganisms from the scraps of food that they scavenge. Additionally, there’s no telling what they might eat. Of course, you can always give them highly nutritious cat food but if you’re too busy, then you’ll definitely need one of our top ten automatic cat feeders to make your life a lot easier. Feline nutrition is a rather tricky business simply because cats are naturally carnivores. However, millennia of domestication have clearly altered their way of feeding. Nevertheless, we can never really truly erase from their genes their predatory nature, preying on other animals. 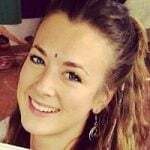 As such, their diet is primarily composed of protein and fats. With the PetSafe Electronic Pet Feeder, you’re now able to provide the best nutrition for your feline friend whether it is dry food you’re going to give or the more palatable wet diet. 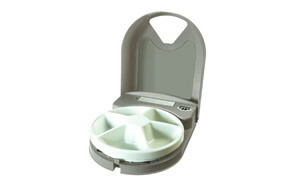 This PetSafe product is fully programmable to rotate its 5 tray feeding chamber at a given time. 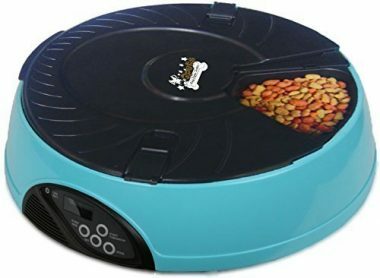 The good news about this automatic feeder for cats is that you can choose between a 2-meal system and one with a 5-meal program. For many of the pet owners we’ve encountered, they prefer the 5-meal device as it gives them the opportunity to provide their cats 5 square meals a day. These can be quite advantageous to minimize the risk of bloating as two large meals per day can be a bit heavy on our pets. Putting too little food and they don’t get the correct nutrition for their daily needs. Too much and we risk bloating plus the chance that the food will spoil or go stale if our furry feline pal doesn’t finish all of it. This is especially true if you are going to put wet pet food. Dry kibbles don’t spoil that much although the taste and texture might change over time. Nevertheless, with the PetSafe system you can be sure that your feline pal will get the correct nutrition it deserves. 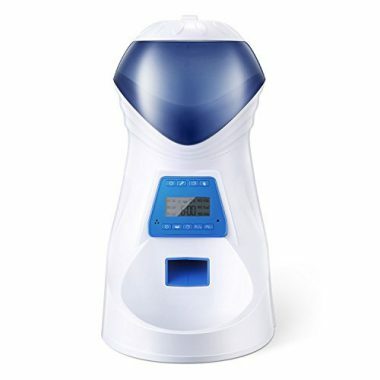 The system comes with a programmable digital timer that automatically rotates its 1-cup capacity 2-chamber or 5-chamber feeding tray with each set time. 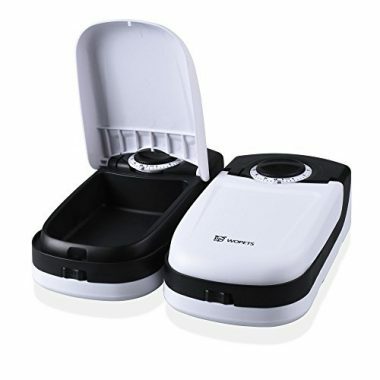 The lid securely latches onto the device covering the other feeding chambers while one is left open for your cat to feed on. Cleaning the polypropylene constructed device is also easy as it can be conveniently popped into an ordinary dishwasher. However, you’d have to have extra supply of size D batteries as it needs 4 of these to operate. What We Like about It – This PetSafe cat feeder with timer has a very simple design yet truly functional. The lid is also able to keep the food from spoilage or going stale. At least, you’ll also not have to worry about hefty electric bills. When we saw the A25 Automatic Pet Feeder with Voice Reminder and Timer, we thought we were looking at a new design of smart home robots. With its truly revolutionary styling the A25 is clearly a must-have by serious cat and dog owners. This cat food feeder can be easily programmed to deliver instant nutrition to your furry friends. The large LCD display gives you an idea of the number of meals that you have programmed as well as the number of meals that have already been consumed by your domesticated animal. At least, there’s no need to guess whether your feline friend has already received its nutrition or not yet. There’s no need to open any lid just to check if there’s still food inside the chamber. There’s an appetite counter, too although we are not really sure how this particular feature works. Since it has an infrared mechanism just above the port where kibbles drop, it is possible that if the tray turns up empty after your feline pal devoured it, then the infrared sensor will send signals to its integrated circuitry to display that your feline friend had a sumptuous meal. 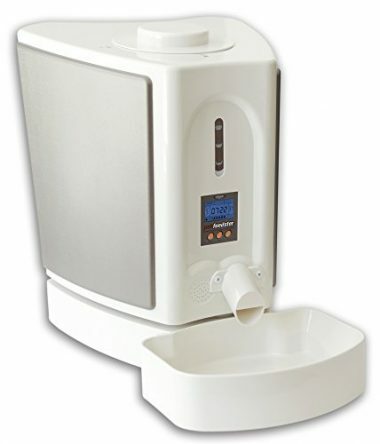 What is truly amazing about the A25 is that you can set the exact amount of kibbles or semi-moist nutrition that will be dispensed by the device. The lowest you can set it is at 1/32 cup or about 1/3 of an ounce per meal while the most you can set it to is 7 cups. Perhaps if you have a really voracious feline, then the 7 cups per meal setting will come in very handy. You can also program the A25 to deliver kibbles up to 6 times per day. The good news is that you can call your feline friends when it’s time to eat. To do this, you’ll have to record your voice calling out to them during mealtimes. You have 12 seconds to make a very good vocal impression of how you’re going to call them. Every time the A25 dispenses feline nutrition, it first plays your recorded voice so they’ll come running towards the A25. ANMER recommends filling the A25 with dry kibbles but not larger than 1 square centimeter in size. Semi-soft or semi-moist pet food can also be placed into the compartment although it is a lot easier to just give the kibble. What We Like about It – The A25 has a really futuristic design that you won’t even think that it’s actually a cat food dispenser. The inclusion of a voice-recording and call out feature is also exemplary. One of the risks of overfeeding our cats is that they do tend to bloat or even vomit the excessive amount of food that we give. To help address this, it is often preferable to give smaller but more frequent feedings. Another way to do it is by slowly giving food over a much longer period of time to help prevent gulping. Such is the purpose of the Healthy Pet Simply Feed timed cat feeder. This PetSafe feline nutrition delivery system allows you to slowly dispense your cat’s favorite meal over a period of 15 minutes so that it will not have to gulp and vomit. However, this is only accessible if you are going to put a meal that is greater than an eighth of a cup. 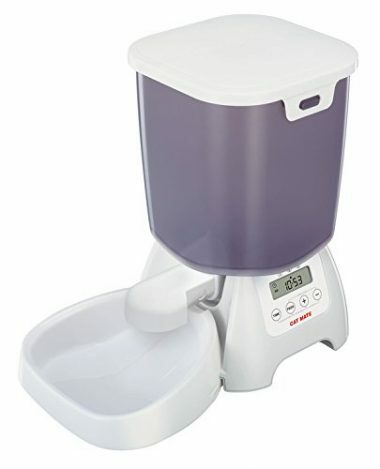 The maximum amount that you can program it to dispense is 4 cups per meal. But, here’s the good part, the Healthy Pet can be programed to schedule the delivery of your feline friend’s meals up to 12 times a day. This means you can actually design a very specific menu delivery program for your beloved feline. But what if your furry friend needs some more? Well, don’t fret. This PetSafe product has an Immediate Feed Mode which effectively bypasses the already-programmed schedule. So, if you programmed it to deliver meals every 6 hours and your pet is obviously hungry, then just push a button and it can already have its meal. The same is true when your animal pal is simply not in the mood to eat. You can simply activate the Pause Feed Mode and you can bet that it will not affect any prior programming. Resuming the schedule is as easy as turning off the pause mode. The Healthy Pet Simply Feed auto pet feeder also comes with a food chamber that’s secured by an air-tight lid. This helps keep your cat’s food fresh, not stale. The feeding bowl is also made of stainless steel adding a level of hygiene not always seen in plastics. What We Like about It – This PetSafe product has a superb design. But what really impressed us is the built-in override mechanism. At least, you’re still in full control of the device. 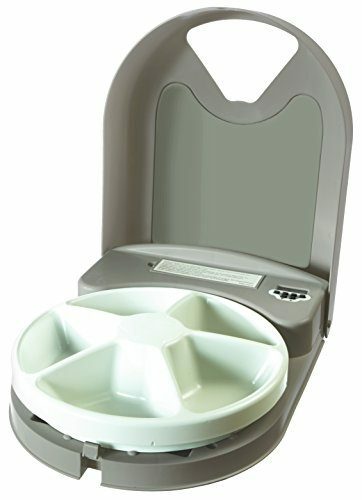 It may look like an ordinary pet food bowl that has a cover but the AF-108 6-Meal Auto Pet Feeder is anything but ordinary. The best part of the AF-108 is its 6-compartment bowl design. It easily translates into 6 different meals for your feline friend. You can put its favorite kibbles or even its preferred wet food. And if you’re concerned that the moist diet will spoil or will go stale, the airtight lid helps prevent contamination as well as spoilage. Your curious kitty won’t be sticking its paws into other food compartments. The one truly amazing feature of the AF-108 however, is not really its 6-meal compartment design, but rather its programmable voice callout feature. This allows you to record a full 6-second voice message to call your feline friend to the AF-108. We know that this is just half the time afforded by the ANMER A25 at 12 seconds. But we do recognize the fact that a well-trained kitty should be able to respond to your voice in an instant. There’s another way you can go about this: be sure to create a callout that is sure to get your kitty running to you in an instant. It also has a built-in LCD display that helps you keep track of the feeding behavior of your kitty. Now, you don’t have to pry open the lid just to get an idea if the meal is still there. What We Like about It – The AF-108 may not be as technologically advanced as the others in our list but it sure does deliver on its promise of adequate and timely nutrition for our kitties. Perhaps, a redesign of the bowl might help? You might think of the WOpet Automatic Pet Feeder with Ice Pack as a tightly packed pair of children’s shoe because of its unusual design. Try to imagine two oblong shaped canisters with a black base and 2 rounded black dials on one end of each of these canisters. Or better yet, try imagining the trash bin that you have in the office, the one that has a foot pedal to open the lid. Well, that’s actually how the mechanism of the WOpet works although it has a built-in timer and that the depth of the bin is just several inches high. This automatic feeder for cats is quite unique in that it doesn’t have any complex mechanisms. The timer is an analog, rotary type of dial much like the combination lock we put in our safes. To set the timer, just rotate the dial and point the arrow to the desired number of hours the lid opens. For instance, if you decide to pop open the lid every 2 hours so your kitty can have its chow, then you simply have to turn the dial and point the arrow to the number 2. Nothing really complicated. The maximum length of time you can set the timer to is 48 hours although it’s like saying feeding your kitty once every two days only. The WOpet also comes with 2 ice pouches so you can place one on one of the compartments so your kitty can have a cool and refreshing drink afterwards. We’ve also noticed that some kitty owners actually put drinking water into one of the compartments so it serves two purposes. What We Like about It – The WOpet has an interesting design and a very simple timing mechanism. Unfortunately, we have learned that there have been issues about incorrectly-functioning dials. But this was actually remedied by the company in an instant. So, good customer service for that. 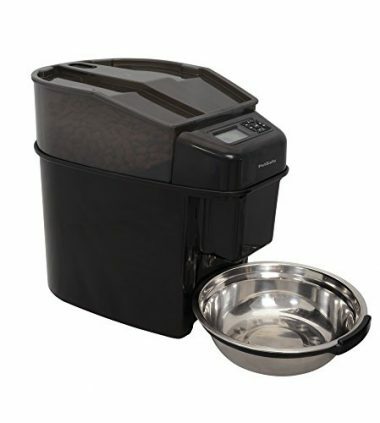 Looking at it, you’d think that the C3000 Automatic Dry Food Pet Feeder is a water jug and food processor combined. Well, it has a spout that makes it more like a water jug. Its base has electronic controls that you often see in a blender or even a food processor. Regardless of how you would describe the C3000, this cat feeder with timer is one amazing feat of engineering. The tamper-proof nozzle helps keep your kibbles safe and fresh without going stale. The kibbles are kept safe, dry, and fresh in the tinted plastic hopper that can accommodate up to 6.5 pounds of excellent quality feline kibbles. The LCD and control panel are a beauty to touch giving you superb control over the feeding schedule of your kitties. You can set it to dispense food as little as 10 grams. This is especially useful if you have kittens instead of adult ones or perhaps you have a sick kitty who’s lost its appetite due to illness. Whatever the case, you’ll find the C3000 cat food feeder a true gem to use. The C3000 operates on 4 pieces of C size batteries that has been rated to keep the C3000 running for a good 9 months tops. What We Like about It – The energy efficiency of the C3000 makes it an ideal solution for today’s kitty feeding needs. What we love about it is its truly ingenious design although its kibble-only packaging is quite a drawback. The Lusmo timed cat feeder has a very chic and vibrant feel to it. It has the same programmable capabilities as the rest of our top 10 products in this list. It’s got excellent portion control that allows for superb programming so you’ll have a splendid way of ensuring the correct nutrition for your kitty. There’s even a mischief guard so your furry pal won’t be sticking any tongue or paw into the food port. The compartments are fully washable so you don’t need to get anxious about their food getting contaminated by dirty canisters. 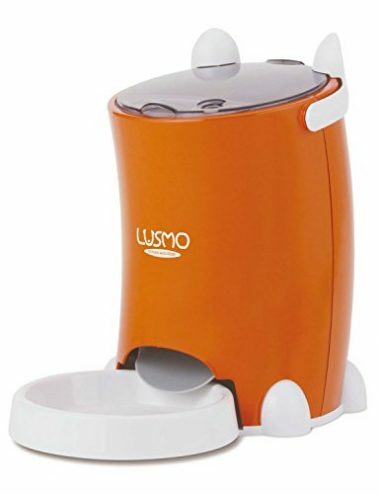 But one thing that is really great about the Lusmo is that it has an override mechanism so you can always give your pets something to eat from this auto pet feeder whenever they feel like it. And with a truly chic design, we’re pretty sure you’ll love displaying the Lusmo in your kitchen as well as in any other part of your house. What We Like about It – The Lusmo’s chic design is marvelous to look at. But what really makes it very good is its superb portion control. 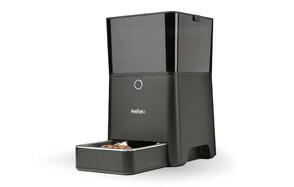 If you need an automatic feeder for cats, we suggest buying the PF-10 Feedster. With an ant-proof and insect-proof design and a sturdy construction, we guarantee you will love the PF-10. You can program it to dispense kibbles as small as a tablespoon portion or even as many as 6 cups although we really are not sure if it’s advisable to give this much in a single meal. The Feedster PF-10 comes with a backup power supply that runs on batteries so you can be assured of continuous operation even though you’ve got power outage. One really great thing about the PF-10 Feedster is its kibble protection so your kitty won’t be sticking its paws into the food compartment. What We Like about It – The PF-10 Feedster has a mechanical design that’s truly functional. However, it’s its superb protection against insects that makes it a great buy. 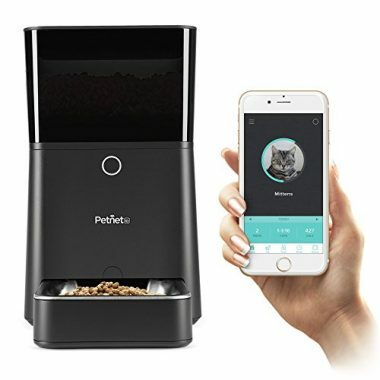 Designed especially for the smart home, the SmartFeeder Automatic Pet Feeding System is truly one of a kind as you can effectively control all the feeding requirements of your kitty just by downloading the SmartFeeder app into your iOS or Android device that runs on at least iOS 7.1 or Kitkat, respectively. The app already allows you to control the feeding times, the ingredients, and the portion sizes of your pet’s feeding. The food delivery system allows you to program portions as small as 1/16th of a cup to a maximum of 1.5 cups. The hopper has an amazing capacity of up to 7 pounds. Unfortunately, you can only put dry kibbles as the portion control is designed to accommodate only dry weight. This cat food feeder is one truly ingenious solution to the nutritional needs of our cats. What We Like about It – The smart technology integrated into the SmartFeeder is revolutionary, so to speak. It understands the nature of today’s families that we can only hope other systems would also integrate. Choosing an automated cat food dispenser should have been as easy as picking a water dispenser or even a lunch box for our kids. Unfortunately, we never realized that these feeders are so technologically advanced that we had to mentally deconstruct every single shortlisted feeding system in our list. Before this, however, we had to identify which to include in our list of top 20 so we’ll have a better chance of getting the ten best. We looked at the products’ overall rating including the feedback and customer reviews that have been written about these products. While it’s inadvertent that not everyone will be satisfied with all of these products, the main contention is that, if a great number of pet owners have a strongly positive experience with these devices, then we can be sure that you’d find them very useful for your pets, too. Part of the evaluation process is an understanding of the device’s manufacturer. It is imperative that it complies with all regulatory protocols and guidelines. Additionally, a brand’s credibility can certainly go a long way as companies with an excellent reputation will do everything they can to ensure they remain trustworthy. Once we have completed the top 20, we then subjected each one to very careful scrutiny. Since we’re talking about pet nutrition, the technology inherent in the device should be able to ensure the freshness of the food. It should have a mechanism that will not allow food to spoil or go stale especially if you’re going to put wet instead of dry pet nutritional products. Because pet nutrition is best achieved in a scheduled routine, a timed cat feeder system must be present that will help provide adequate nutrition for our pets at exactly the correct time and frequency. The timer must, therefore, be flawless and can be easily set according to your pet’s needs. Other features were also scrutinized as to their exact purpose and how these can benefit your pet. The construction of the device was also examined. If it’s made of plastic, then it should not have harmful chemicals like BPA. It must also be certified to be pet-safe. And speaking of safety, since most automated nutrition delivery systems have mechanical parts that run on some form of electricity, whether it’s DC or AC, it is crucial to look at how the power assembly has been integrated into the design. It should not get in the way of our cleaning. 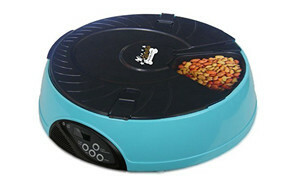 In this regard, the auto pet feeder must also be easily to maintain as well as clean. Otherwise, what’s all the convenience in feeding our furry friends when it would take us literally hours to clean their feeding devices? The top 10 is thus, a reflection of the different parameters that we had to consider. This gives us the assurance that you’ll love what we put in our list. Like all living organisms, cats require food for a variety of their physiologic processes. However, there are certain distinctions between a feline diet and canine nutrition. 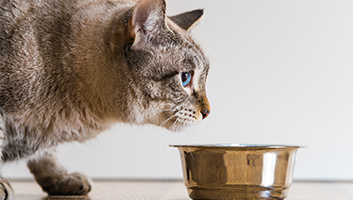 To understand basic feline nutrition, it is imperative to take a close look at 4 important principles that need to be considered when choosing the right food for your cat. All cats need water to maintain healthy and normally functioning kidneys. A healthy urinary system is vital to cleansing the blood and deliver the right amounts of oxygen and other electrolytes to the rest of the body. As such, water is an important nutritional requirement for all living things, including cats. It is therefore, crucial to augment your cat’s food with clean and refreshingly cool water to entice them to drink. If this is not possible, then their food must contain enough moisture to allow for adequate hydration. Too much carbohydrates can disrupt the delicate sugar and insulin balance in cats. Have you ever seen a cat that feasts on vegetables and other carbohydrate-rich foods? In the wild, cats have been programmed by nature to thrive on protein and fat and less on carbohydrates. Feeding them a diet can upset the delicate balance between blood sugar levels and insulin which can lead to post-prandial hyperglycemia. This can result to a variety of health problems for your kitty. It is thus, very important to choose cat food that has significantly less carbohydrate content. All cats have an inherently low thirst drive. Dry cat food only contains, at most, 10 percent water. Compare this to cat’s prey in the wild which often contains 70 to 75 percent water. Because of their predatory nature, cats have a very low thirst drive. You don’t expect them to get thirsty simply because they get their water from the food that they eat. Unfortunately, giving them dry cat food may not be able to provide this need for hydration. All cats are obligate or strict carnivores. As we have said in point number 2, cats require high quality protein. It should be clear that what we’re talking here is animal protein, not plant protein. This is because plant protein don’t have taurine which is essential in maintaining a healthy heart and eyesight in cats. And since cats are natural predators – obligate carnivores – they need a very keen eyesight to help them look for their prey. But, there’s a much lighter side to this principle: cats in the wild prey on other animals; they don’t eat grass nor leaves. As such, in choosing the most appropriate food for your cat, it is important to look for animal-based proteins and fats. We know you are thinking that we are essentially advocating the use of wet cat food instead of dry kibbles. These are just the basic truths to feline nutrition. You can still provide your kitty with dry kibbles, just make sure you can also get them to drink. Additionally, you will also have to make sure that the dry kibble has more animal-based proteins and fats and less or no carbohydrates at all. Meeting the nutritional requirements of your pet cat can be tricky. Nevertheless, with our top ten automatic cat feeders in 2016, you’re now simply left with the task of deciding whether to give them kibbles or wet food or even both.